We propose a novel guess-and-check principle to increase the efficiency of thread-modular verification of lock-free data structures. We build on a heuristic that guesses candidates for stateless effect summaries of programs by searching the code for instances of a copy-and-check programming idiom common in lock-free data structures. 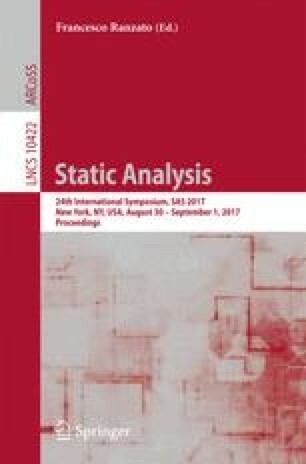 These candidate summaries are used to compute the interference among threads in linear time. Since a candidate summary need not be a sound effect summary, we show how to fully automatically check whether the precision of candidate summaries is sufficient. We can thus perform sound verification despite relying on an unsound heuristic. We have implemented our approach and found it up to two orders of magnitude faster than existing ones. This work was supported by the Czech Science Foundation project 16-24707Y, the BUT FIT project FIT-S-17-4014, the IT4IXS: IT4Innovations Excellence in Science project (LQ1602), and by the German Science Foundation (DFG) project R2M2. The full version is available as technical report . R. Meyer–A part of the work was done when the author was at Aalto University.